Clipper Vriendschap - Boat rental? Not even those long ago sailing ships ruled the Dutch inner waters They were used for the transport of peat, fatten, sand, gravel and stones. Their work area stretched himself from of Denmark to United Kingdom. Around 1900 the clipper wa introduced a larger and faster ship than the older flat bottom designs. “de Vriendschap” is one of those early clippers. 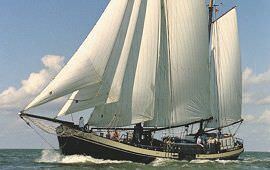 Who sails with “de Vriendschap” experiences that rich history in person. Modern times has already changed a lot , the tradition of sailing not!